When a blogger or journalist furthers their personal brand within a newsroom, who benefits? The New York Times’ Nate Silver is moving his FiveThirtyEight empire to ESPN, the Washington Post is launching a tech policy blog, and the Times quietly killed its Media Decoder blog (which had no guiding personality). Which blogs work for which newsroom? How important is the blog chief’s notoriety to the blog’s success? The Daily Dish’s Andrew Sullivan, social media guru Sree Sreenivasan of the Metropolitan Museum of Art and Tim Lee of the Washington Post will join us for a discussion of big-name blogging’s place in media organizations. MediaShift’s Mark Glaserhosts, along Andrew Lih from American University and former paidContent editor Staci Kramer. If you’re not a friend of mine on Facebook (sorry), you probably haven’t seen many pictures yet of my tour through the beautiful country of Costa Rica. 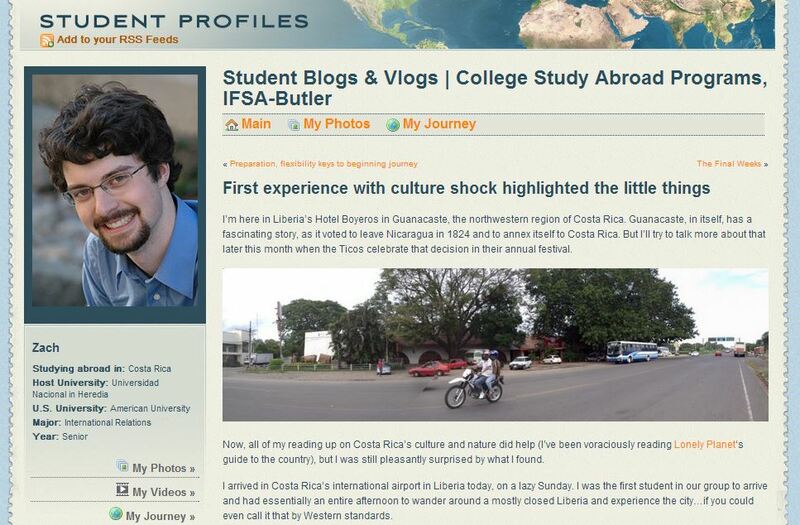 Check out the pictures on my ongoing blog at IFSA-Butler, my study abroad program. This time, I feature San José, the capital of Costa Rica, and la Rincón de la Vieja, an active volano. I told my host mom the day I moved in that my Internet didn’t work. 15 minutes later, four different ticos, from at least three generations of the same family, were in my room (pictured here) trying to get my computer to work. Like most media, the future of television is online. This edition of the Mediatwits, we’ll talk about the prospects for tech upstarts Apple, Google, Intel and Sony, who are trying to push their way into the lucrative TV and entertainment business. Apple is aiming to work with incumbent cable companies, while Google is working against them. Meanwhile, Netflix’s original content has planted it on the same Emmy stage as major television networks and cable channels, winning 14 Emmy Award nominations. Plus, the winner of the bidding for buying Hulu was… Hulu? Hulu didn’t sell itself in the end, probably because it’s worth more than even the generous offers. Special guests Brian Stelter of the New York Times and Tracy Swedlow from the TV of Tomorrow show will parse out the future of online TV viewing and the role of Silicon Valley in Hollywood. MediaShift’s Mark Glaser hosts, along with Mónica Guzmán from the Seattle Times and GeekWire, and Andrew Lih from American University. Get all the latest news on these subjects, along with bios of the guests. The Eagle, American University’s student newspaper, has an agreement to syndicate quality content through UWire to other college newspapers. A pleasant surprise: Three of my articles written for the newspaper were picked up for UWire for syndication. Former presidential candidate Jon Huntsman has come a long way from getting his “ticket to ride” by finishing third in the New Hampshire primaries. “Put whatever I’m going to tell you tonight in proper perspective, because I’m just a loser,” Huntsman told students and alumni at American U. on April 18. American U. students joined their peers from other D.C. universities to protest high student loan debt on Oct. 28. 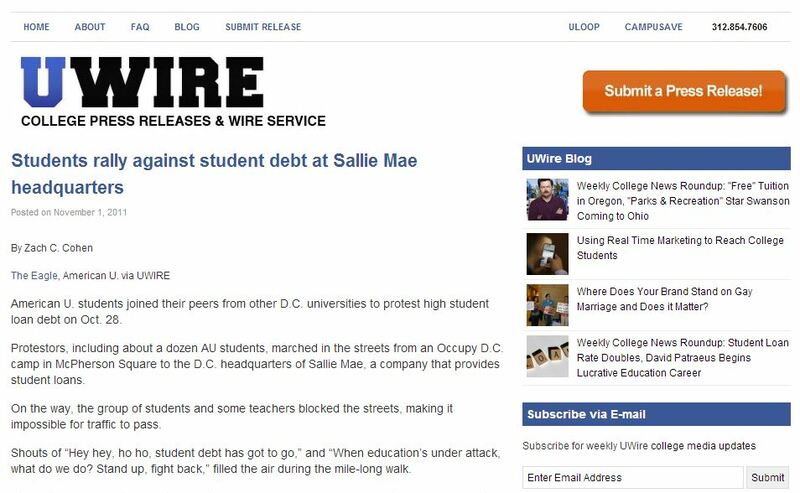 Protestors, including about a dozen AU students, marched in the streets from an Occupy D.C. camp in McPherson Square to the D.C. headquarters of Sallie Mae, a company that provides student loans. On the way, the group of students and some teachers blocked the streets, making it impossible for traffic to pass. Shouts of “Hey hey, ho ho, student debt has got to go,” and “When education’s under attack, what do we do? Stand up, fight back,” filled the air during the mile-long walk. American U. evacuated all on- and off-campus buildings for a short period of time following a 5.9 magnitude that rocked the eastern United States Tuesday. 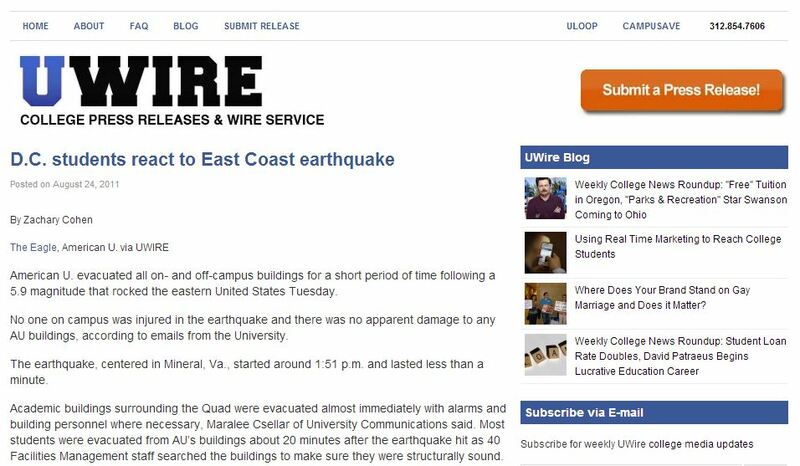 No one on campus was injured in the earthquake and there was no apparent damage to any AU buildings, according to emails from the University. The earthquake, centered in Mineral, Va., started around 1:51 p.m. and lasted less than a minute. Do you know where these stories eventually appeared? Because I don’t. 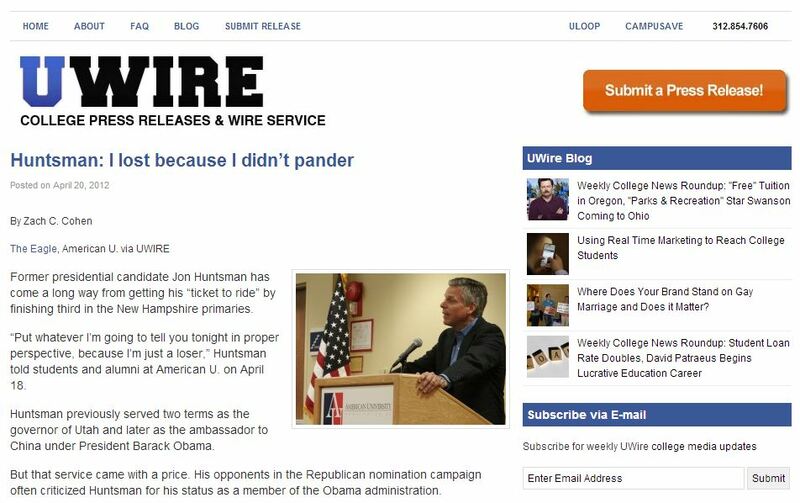 UWire asks its clients, of which The Eagle is one, to publish the story in print, not online, to retain the value of the original publisher’s post. If you saw these stories in print anywhere other than The Eagle, please let me know and comment on this post. When news happens, where do you turn first? A recent Gallup poll says most people still turn to TV, but if you followed the recent airplane crash at SFO or the military coup in Egypt, you know the action was on social media. We’ll discuss the role that social media plays in breaking news, how journalists are using social media, and what they can do better with special guests Vadim Lavrusik of Facebook and Yumi Wilson of LinkedIn. Next, we’ll talk about the rise of The Guardian, a British newspaper that has pushed hard online into the U.S., and how its recent scoops with Edward Snowden over the NSA snooping have brought it head-to-head with NYTimes.com. MediaShift’s Mark Glaser hosts, along with former paidContent editor Staci Kramer. Get the back story on all of this news, plus bios of our guests. Today was my last full day in Liberia, one of the bigger cities in Guanacaste, the northwest region of Costa Rica. I had a great time climbing volcanoes, touring the clubs and dancing/singing with ticos. But one the best, worst parts of my first week here: Spanish. 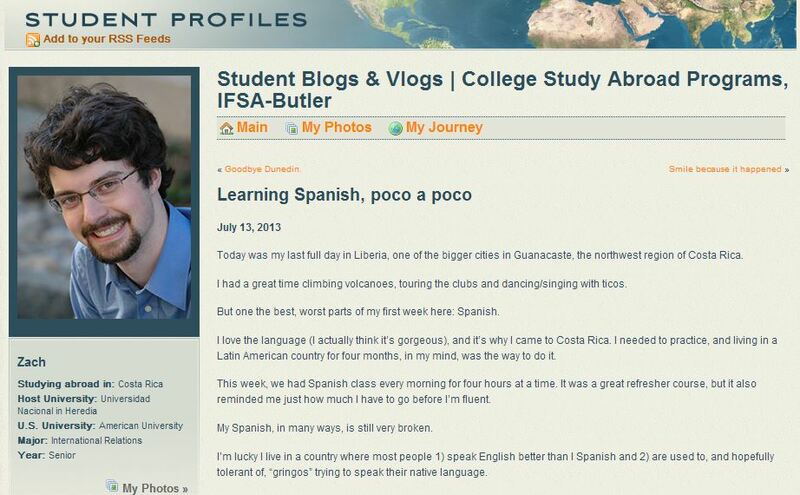 I misspoke in the original headline, “Learning Spanish, poco por poco.” The saying is, “poco a poco.” Clearly I’m not learning Spanish as quickly as I thought. h/t to Paige Jones for pointing out the error. I’m here in Liberia’s Hotel Boyeros in Guanacaste, the northwestern region of Costa Rica. Guanacaste, in itself, has a fascinating story, as it voted to leave Nicaragua in 1824 and to annex itself to Costa Rica. But I’ll try to talk more about that later this month when the Ticos celebrate that decision in their annual festival. Now, all of my reading up on Costa Rica’s culture and nature did help (I’ve been voraciously reading Lonely Planet‘s guide to the country), but I was still pleasantly surprised by what I found.